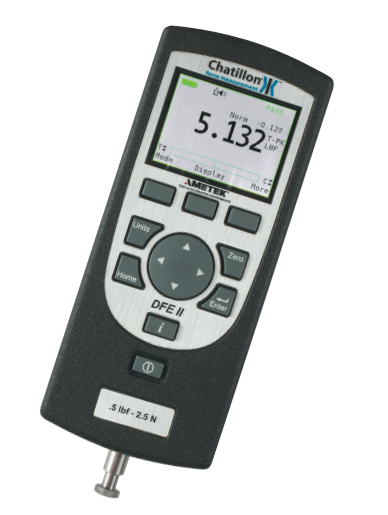 The Chatillon DFE II Series marks a new era in digital force measurement. This compact, easy-to-use force gauge is designed for economy applications without compromising functionality. Ideal for handheld or test stand applications. The DFE II Series is available with capacities from 2lbf (10 N) to 500 lbf (2500 N). The DFE II features an integral load cell with a measurement accuracy of better than 0.25% full scale. A large, easy-to-read, high-resolution dot matrix LCD full-color display supports a variety of standard gauge functions including normal and peak readings, high/low limits, setpoints, pass/fail results, statistical results, load cell actuation, and direction. Loads are displayed in ozf, gf, lbf, kgf and N units. The display can be inverted and displayed results may be hidden from the operator. All DFE II Series force gauges come with a carrying case, battery adapter/charger, testing accessories, RS232 cable and NIST Certificate of Calibration with data.